Republicans from across Scotland are gathering today in Glasgow for the annual Hunger Strike March. The culmination of prison protest that began in 1976, the 1981 hunger strike is one of the most significant events in Irish history and recognised to have moved Ireland’s struggle for freedom onto a new level both internationally and in Ireland. 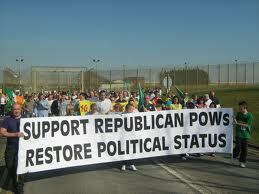 For republicans in Scotland support for POWs has always been a key part of our activities. Sadly, while much has changed over the last 20 year much has also remained the same. This includes the continued imprisonment of republican political prisoners in British jails. These men and women are imprisoned as a direct result of the British state’s occupation of Ireland. They are political prisoners and should be accorded that status immediately. These political prisoners are suffering terrible abuse at the hands of the British state and deserve the support of all republicans. Mick Hanley’s classic On The Blanket is still as relevant today as it was when it was written.